The Battle of Moscow (Russian: Битва за Москву, Bitva za Moskvu) is a 1985 Soviet two-part war film, presenting a dramatized account of the 1941 Battle of Moscow and the events preceding it. The films were a Soviet-East German-Czechoslovak-Vietnamese co-production directed by Yuri Ozerov who also wrote the script. It was made in time for the 40th anniversary of the Allied victory over Nazi Germany and the 20th anniversary of the proclamation of the Victory Day holiday and Moscow's declaration as a Hero City. In the aftermath of the victory in France, Hitler decides to attack the Soviet Union and selects Marshal von Bock in charge of leading Army Group Center of the Wehrmacht into Russia. Ilse Stöbe, Rudolf von Scheliha and Richard Sorge inform of the danger, but the Soviet intelligence dismisses their warnings. Zhukov is concerned that the army is ill-prepared; Pavlov decries him as a fear-monger. The Red Army officers are convinced that in the event of an invasion, they would immediately counter-attack. On 22 June 1941 Germany launches Operation Barbarossa, overwhelming the Soviets. Operation Barbarossa was the code name for the Axis invasion of the Soviet Union, which started on Sunday, 22 June 1941, during World War II. The operation stemmed from Nazi Germany's ideological aims to conquer the western Soviet Union so that it could be repopulated by Germans (Lebensraum), to use Slavs as an slave labour force for the Axis war effort, and to seize the oil reserves of the Caucasus and the agricultural resources of Soviet territories. 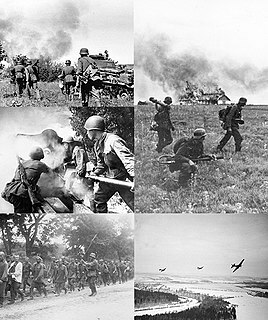 The Red Army tries to counter the assault with a string of hasty operations, while the Brest Fortress is desperately defended. The Soviets manages to recapture Yelnya but having Lieutenant General L.G. Petrovsky killed in action. Stalin insists on defending Kiev, and his forces suffer immense losses. Brest Fortress, formerly known as Brest-Litovsk Fortress, is a 19th-century Russian fortress in Brest, Belarus. 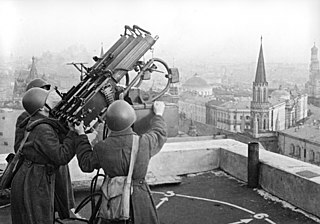 In 1965, the title Hero Fortress was given to the Fortress to commemorate the defence of the frontier stronghold during the first week of the German-Soviet War, when Nazi Germany invaded the Soviet Union on June 22, 1941, with the launch of World War II's Operation Barbarossa. The title Hero Fortress corresponds to the title Hero City, that was awarded to an eventual total of twelve Soviet cities. The Wehrmacht enacts to attack Moscow in which Hitler decides to call it Operation Typhoon. Richard Sorge finds out that Japan won't attack the USSR in 1941. The Germans approach the Soviet capital, winning the Battle at Borodino Field and breaching the Mozhaisk line. Stalin decides to remain in Moscow. The Battle at Borodino Field was a part of the Battle of Moscow, on the Eastern Front of World War II. While referring to the battle in Russian, the Borodino Field is actually more commonly applied rather than just Borodino, cf. Georgy Zhukov. The enemy is at the outskirts of the city, yet the traditional 7 November parade takes place as always. Zoya Kosmodemyanskaya is captured and executed, and Panfilov's men fight to the last. Rokossovsky begs Zhukov to allow retreat but is refused. After all seems lost, the Germans grind to a halt since because of the harsh winter. On 6 December, the Soviets launch a successful counter-offensive by using the air force, the cavalry, tanks, and ski troops. Forcing the Germans to retreat, causing Hitler to blame his generals. Zoya Anatolyevna Kosmodemyanskaya was a Soviet partisan, and recipient of the Hero of the Soviet Union. She was one of the most revered heroines of the Soviet Union. Ivan Vasilyevich Panfilov was a Soviet general and a posthumous Hero of the Soviet Union, known for his command of the 316th Rifle Division during the defense of Moscow at the Second World War. Not to be confused with the Panfilovtsy in general. Liberation is a film series released in 1970 and 1971, directed by Yuri Ozerov and shot in wide-format NIKFI process (70 mm). The script was written by Yuri Bondarev and Oscar Kurganov. The series was a Soviet-Polish-East German-Italian-Yugoslav co-production. Soldiers of Freedom is a four-part 1977 film epic directed by Yuri Ozerov and starring Mikhail Ulyanov, Yevgeny Matveyev, Vasily Lanovoy. It is a World War II historical drama and the sequel to Liberation. Yakov Tripolski as Joseph Stalin. Anatoly Nikitin as Mikhail Kalinin. Nikolai Zasukhin as Vyacheslav Molotov. Vyacheslav Ezepov as Alexander Shcherbakov. Vladimir Troshin as Kliment Voroshilov. Stepan Mikoyan as Anastas Mikoyan. Evgeni Novikov as Nikolay Shvernik. 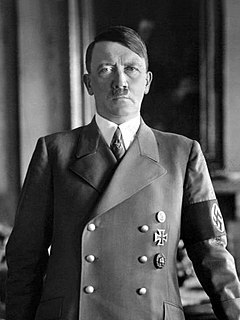 Achim Petri as Adolf Hitler. Olegar Fedoro as People's Commisar. Rostislav Yankovsky as General Vasily Smirnov. Mikhail Ulyanov as Marshal Georgy Zhukov. Aleksandr Filippenko as General Dmitry Pavlov. Bruno Freindlich as Marshal Boris Shaposhnikov. Yury Yakovlev as General Leonid Petrovsky. Juozas Budraitis as Richard Sorge. Aleksandr Goloborodko as General Konstantin Rokossovsky. Vitali Rozstalnoi as Marshal Semyon Timoshenko. Emanuil Vitorgan as Commissar Yefim Fomin. Leonid Kulagin as General Maksim Purkayev. Lev Pregunov as General Lev Dovator. Gennadi Saifulin as General Dmitry Lelyushenko. Irina Shemliova as Zoya Kosmodemyanskaya. Irina Gubanova as Zoya's mother. Konstantin Stepankov as General Ivan Panfilov. Gennadi Frolov as General Timofei Orlenko. Nikolai Ivanov as Colonel Victor Polosukhin. Victor Zozulin as General Mikhail Katukov. Vasily Korzun as General Dmitry Ryabyshev. Nikolai Kryuchkov as old man in Vyazma. Oleg Stefan as Lieutenant Manchich. Leonid Evtifiev as General Vasily Sokolovsky. Aleksandr Voevodin as Commissar Vasily "Diev" Kluchkov. Piotr Glebov as Marshal Semyon Budyonny. Nikolai Volkov as General Mikhail Kirponos. Aleksandr Martinov as General Ivan Kopetz. Boris Scherbakov as General Mikhail Romanov. Valeri Yurchenko as Commissar Nikolai Popel. Romualds Ancāns as Major Pyotr Gavrilov. Vladimir Kuznetsov as General Nikolai Vashugin. Boris Guasakov as General Dmitriy Ustinov. Yuri Gusev as General Vladimir Klimovskikh. Mikk Mikiver as General Ivan Konev. Valeri Karen as General Hovhannes Bagramyan. Joachim Tomaschewsky as Field Marshal Hans von Kluge. Erik Veldre as General Heinz Guderian. Gerd Michael Henneberg as Field Marshal Wilhelm Keitel. Ernst Heise as Field Marshal Fedor von Bock. Aleksandra Pakhmutova made the music and the movie soundtrack. The movie's theme song "You're my hope, you're my joy" was composed by her and Nikolai Dobronranov, and was sung by Lev Leshchenko. Georgy Konstantinovich Zhukov was a Soviet Red Army General who became Chief of General Staff, Deputy Commander-in-Chief, Minister of Defence and a member of the Politburo. During World War II he participated in multiple battles, ultimately commanding the 1st Belorussian Front in the Battle of Berlin, which resulted in the defeat of Nazi Germany, and the end of the War in Europe. 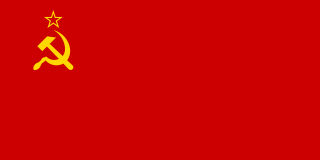 The Order of the Red Banner was the first Soviet military decoration. The Order was established on 16 September 1918, during the Russian Civil War by decree of the All-Russian Central Executive Committee. 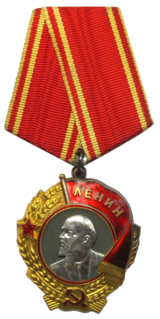 It was the highest award of Soviet Russia, subsequently the Soviet Union, until the Order of Lenin was established in 1930. Recipients were recognised for extraordinary heroism, dedication, and courage demonstrated on the battlefield. The Order was awarded to individuals as well as to military units, cities, ships, political and social organizations, and state enterprises. In later years, it was also awarded on the twentieth and again on the thirtieth anniversary of military, police, or state security service without requiring participation in combat. Yuri Ozerov was a Soviet film director and screenwriter. He directed twenty films between 1950 and 1995. Ozerov's works won him many awards, among them the title People's Artist of the USSR which was conferred upon him in 1977. The Fall of Berlin is a 1950 Soviet war film and an example of Soviet realism, in two parts separated in the manner of a serial, directed by Mikheil Chiaureli, released by the Mosfilm Studio. The script was written by Pyotr Pavlenko, and the musical score composed by Dmitri Shostakovich. It starred Mikheil Gelovani as Joseph Stalin. The Battle of Stalingrad is a 1949 two-part Soviet epic war film about the Battle of Stalingrad, directed by Vladimir Petrov. The script was written by Nikolai Virta. Konstantin Fedorovich Telegin was a Soviet general and a political officer. Stalingrad is a 1990 two-part war film written and directed by Yuri Ozerov, and produced by Quincy Jones and Clarence Avant. Revolving around the eponymous Battle of Stalingrad, the film was a co-production between the Soviet Union, East Germany, Czechoslovakia, and the United States. It stars an ensemble cast featuring Powers Boothe, Mikhail Ulyanov, Bruno Freindlich, Fernando Allende, Sergei Garmash, Nikolai Kryuchkov, and Ronald Lacey. The following lists events that happened during 1923 in the Union of Soviet Socialist Republics. ↑ "Юрий Николаевич Озеров. Биографическая справка | РИА Новости - события в России и мире: темы дня, фото, видео, инфографика, радио". Rian.ru. 2011-01-26. Retrieved 2017-01-03. ↑ "Блог Николая Семенова. Как избавиться от импотенции за 5 дней". Actorskino.ru. 2016-02-15. Archived from the original on 2012-07-20. Retrieved 2017-01-03. 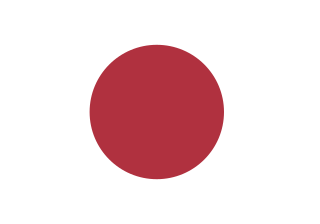 ↑ "Boj o Moskvu - Agrese". Volny.cz. Retrieved 2017-01-03. ↑ "Boj o Moskvu (1985) - Bitva za Moskvu - Agressija, Tajfun". FDb.cz. Retrieved 2017-01-03. ↑ "Энциклопедия отечественного кино". Russiancinema.ru. Archived from the original on 2007-09-10. Retrieved 2017-01-03. ↑ "аХРБЮ ГЮ лНЯЙБС (1985) - Boj o Moskvu - Schlacht um Moskau - ТХКЭЛ - НАЯСФДЕМХЕ - ЯНБЕРЯЙХЕ ТХКЭЛШ - йХМН-рЕЮРП.пс". Kino-teatr.ru. Retrieved 2017-01-03. The Battle of Moscow on the IMDb. The Battle of Moscow on film.ru.